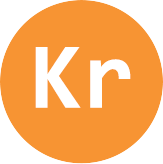 Need compressed and various mixtures of krypton (Kr)? WestAir can provide compressed krypton gas in a variety of purities and mixtures. Mixtures can be customized with component ranges from ppm and ppb up to 50%. WestAir krypton mixtures combine other noble gases, halogen gases, and flammable and toxic compounds. Please see the table below for information and to access safety data sheets on krypton available from WestAir.